Well, by residential, I don’t mean I plan to live in it, but I do imagine I’ll spend a lot of time in it among living things. Last year I purchased a relatively inexpensive — about $100 — aluminum and plastic zipper-case style greenhouse for my patio. It was a good start to see how much I’d really use it, and it came in very handy with the Seattle temps fluxuating like mad all spring and summer last year. Unfortunately, in our big December storms this little greenhouse didn’t fare well. So, I resolved to find the budget to put in a more permanent greenhouse structure for the future. 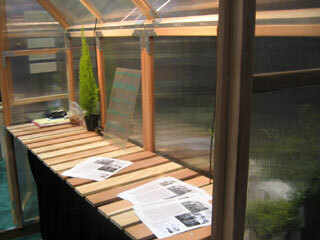 Initially, we had looked at options to construct our own greenhouse from scratch from clear cedar and quad-wall polycarb. 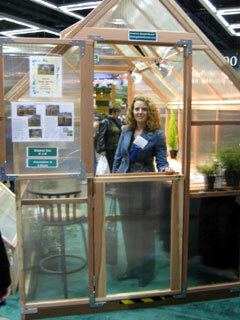 Then, at the Northwest Flower and Garden Show, I saw a kit greenhouse that was similar to the one we were going to build on our own. The construction was a little less “fine woodworking” than our plans, but it was well put together, had solar venting, is built from twinwall polycarb, with a trex footing for ground contact, and clear redwood framing. And, without even looking at our labor to build from scratch, this priced out about the same. So, given the number of other projects on tap and our need for more seedling space, we ordered the greenhouse. We liked the floor model, which actually had a front and backdoor rather than a back wall with a floor vent. This way we’ll be able to enter the front door from the patio and pass through the backdoor into the garden beds, which are fenced from the dog. Yes, the lack of a lower vent may inhibit airflow, but we may make some modifications to create the lower suction. Perhaps we’ll install a lower vent into the bottom half of the back dutch door or even set up the lower door so that it can remain open sometimes. In any case, I can’t wait. The extra beautiful part about this greenhouse is the immediate satisfaction. The kit, which they promise can be assembled in a day, should arrive sometime next week. This means we’ll have extra hardening off space for all of the kale, cauliflower, chard, spinach, lettuce, and cabbage seedlings overtaking the house and cold frame! Plus, we’re rolling into the time of year when clients start ordering plant purchases from me. Often I’ll hold plants for a week or more before delivering them. This will ensure I have a warm, safe spot for them if the weather goes nutty this spring like it did last year! Look forward to posts on how this greenhouse works out in our small residential garden, how our seedlings take to it. And, perhaps one of the most exciting stories will be how and if the passionfruit vine I picked up from Raintree Nursery will actually make it through the winter in the greenhouse and produce fruit, as advertised! Have questions about whether to start a greenhouse of your own? Wondering what makes sense for your small or large space? Get in touch to schedule a consult, and I’ll help you wade through the options and opportunities! I’m jealous! I wondered if anyone ever bought any of those from the show. Glad to hear people do. They’re definitely tempting, but I can’t figure out where in the world I would put it. I too am on a greenhouse search. I saw those, they were quite nice. There’s neither the need nor space for one that size, but oh how I would love just a little greenhouse for my growing number of seedling. The little zipper style ones are actually quite good for small scale gardens. Just take it from my sad experience — they need to be dismantled before winter. And, that’s half the bummer ’cause you don’t have a greenhouse for the really cold months. Still, if you need something to coddle things along in our crazy spring weather, they’re great. Simple zipper shelving units start as low as $34.99 in the gardenhelp.org store section. Link here and look under greenhouses in the right nav bar. Hmmm…well, it might look odd, but I bet we could fit one on the SW corner of your lot. With a door on each end, you could pass right through. Maybe not the most beautiful aesthetic, but very functional….or put it right over your back lawn….or customize a lean-to style the north side of your driveway….so many options! What’s the name of the company that makes your greenhouse? It’s lovely! I’ll be doing a write up on on the greenhouse soon. Several have written in to ask about it, and I just need to get out of the greenhouse and on to the article writing.